Available at all L'Oreal outlets of Life style, Health n Glow, Shoppers stop and also in online shops. The packaging of this lipstick is elegant and it comes in a gorgeous golden colour packaging and it has a button in front of the package in the colour of the lipstick shade. It is travel friendly as the cap of the lipstick is tight and strong. L'Oreal Paris Color Riche Moist Matte Lipstick Raspberry Syrup is a beautiful Raspberry shade with strong pink undertone. The shade is almost looks like a bright fuchsia pink. The texture is so smooth and soft like butter that I can easily swipe the lipstick without tugging the lips. 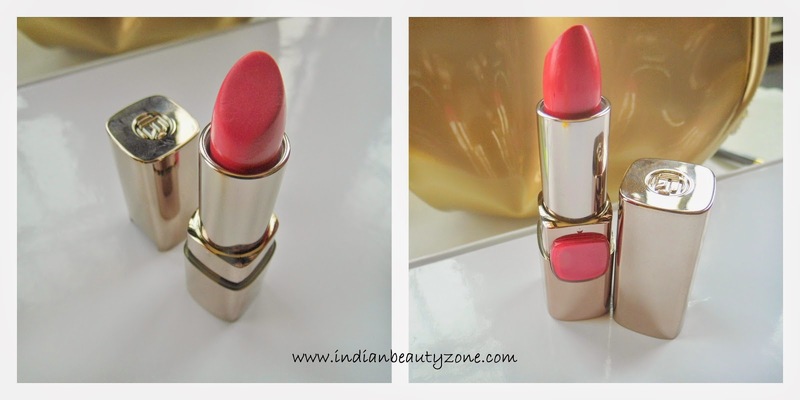 It has superb pigmentation and one swipe is enough to colour your lips beautifully. The shade looks florescent pink in the night time. The pigmentation covers the dark lips very well. This lipstick shade is very beautiful but I never dare to wear it outside. I like neutral and plum lipstick shades mostly to wear. This shade is something new to me that too with matte formula. But, this shade suits me very well and I am sure this share will suits to all skin tone especially those who are medium to dusky. It makes the face bright and pretty. The lipstick stays up to 5 hours without fading with light snack and soft drinks. After that it slowly fades away and leaves a beautiful pink tint which I loved a lot. My Red carpet Outfit look New L'Oreal Lumiere Cannes Lipstick and Kajal . Travel friendly and great packaging. Beautiful bright Raspberry pink shade. This lipstick hides lips pigmentation. Leaves beautiful pink tint on lips. Best choice for matte lipstick lovers. Hydrates lips well and no dryness problem. Not a lipstick for those who want affordable lipsticks. Not a shade for those who don't like bright shades. 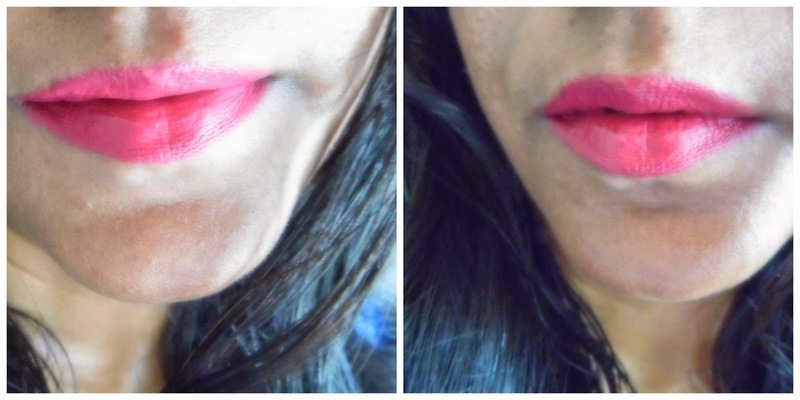 L'Oreal Paris Color Riche Moist Matte Lipstick Raspberry Syrup is an beautiful fuchsia pink shade, it is a must have lipstick for those who love matte and bright lipsticks. This shade will suits for all Indian skin tone mostly. That is a nice color on you. I like it. Its soo pretty and bright! Even I shy away from wearing bright colors outside! I love the brightness; good to spark up appearance for functions. But matte? somehow doesn't fit into my lips. Lovely shade dear! Looks so smooth n pigmented!